One of the things the SOLO (Structure of Observable Learning Outcomes) taxonomy helps us to do is to move into deeper thinking. Multistructural thinking is about knowing and understanding pieces of information about something. Once upon a time this was all that was needed. Many of us adults will remember systematically learning facts and figures to sit tests and exams. A good result often meant we had successfully recalled the facts and figures we had committed to memory (and soon afterwards, forgotten). Of course this wasn't nearly enough at higher levels of learning, and it sometimes meant people were badly prepared for higher learning. With lots of information available online and with an information rich world all around us, recalling information stored in our heads is neither particularly impressive nor useful. However, we certainly need to know how to access, filter and assimilate information which are all skills we can develop at the multistructural stage. What sets our thinkers apart is what they do with the information and the SOLO taxonomy is ONE way of guiding this. If you look at our chart in our staffroom, which will be available at the Parent Learning Hui next Monday 24 August, you will see we have many ways of promoting this type of thinking. One of the most crucial things is to take the first step into relational thinking. Many people need to be supported into this sort of thinking. One way of doing this is to think of the opposite: what would happen if the story had the opposite ending? or what would the world be like with no rules? 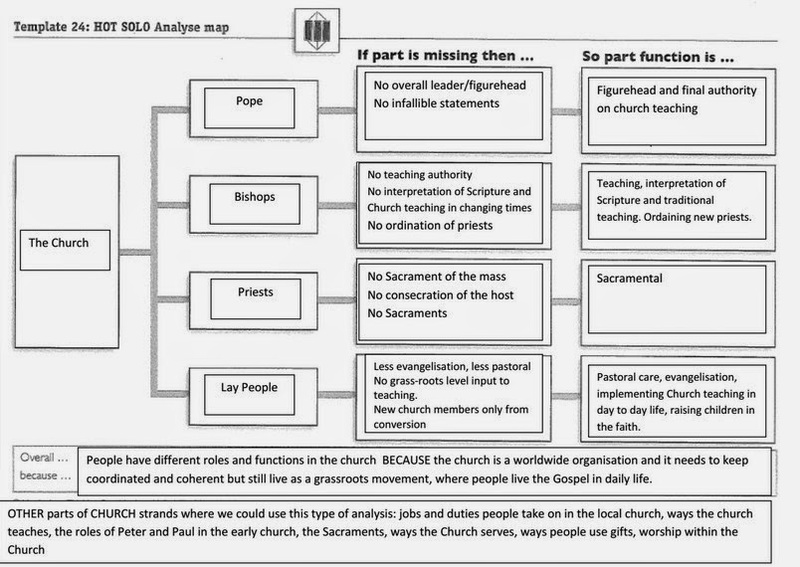 In RE, we have been learning about the Church strand and an activity which promotes this type of thinking is an "Analysis Map (above)." Students are helped to analyse and understand the function of the parts by imagining the effect on the whole if that part were missing. The Analysis Map helps children to further understand the whole by analysing its parts which is an essential thinking skill.